It has been suggested that Politics of the International Space Station be merged into this article. (Discuss) Proposed since January 2019. The International Space Station program is tied together by a complex set of legal, political and financial agreements between the fifteen nations involved in the project, governing ownership of the various components, rights to crewing and utilization, and responsibilities for crew rotation and station resupply. These agreements tie together the five space agencies and their respective International Space Station Programs and govern how they interact with each other on a daily basis to maintain station operations, from traffic control of spacecraft to and from the station, to utilization of space and crew time. In spring 2010, the International Space Station Program Managers from each of the five partner agencies were presented with Aviation Week's Laureate Award in the Space category, and NASA's International Space Station Program was awarded the 2009 Collier Trophy. A Commemorative Plaque honoring Space Station Intergovernmental Agreement signed on January 28, 1998. This Agreement is a long term international co-operative framework on the basis of genuine partnership, for the detailed design, development, operation, and utilization of a permanently inhabited civil Space Station for peaceful purposes, in accordance with international law. The IGA sets the stage for a second layer of agreements between the partners referred to as 'Memoranda of Understanding' (MOUs), of which four exist between NASA and each of the four other partners. There are no MOUs between ESA, Roskosmos, CSA and JAXA because NASA is the designated manager of the ISS. The MOUs are used to describe the roles and responsibilities of the partners in more detail. A third layer consists of bartered contractual agreements or the trading of the partners' rights and duties, including the 2005 commercial framework agreement between NASA and Roskosmos that sets forth the terms and conditions under which NASA purchases seats on Soyuz crew transporters and cargo capacity on unmanned Progress transporters. A fourth legal layer of agreements implements and supplements the four MOUs further. Notably among them is the ISS code of conduct, setting out criminal jurisdiction, anti-harassment and certain other behavior rules for ISS crewmembers. made in 1998. There is no fixed percentage of ownership for the whole space station. Rather, Article 5 of the IGA sets forth that each partner shall retain jurisdiction and control over the elements it registers and over personnel in or on the Space Station who are its nationals. Therefore, for each ISS module only one partner retains sole ownership. Still, the agreements to use the space station facilities are more complex. The station is composed of two sides: Russian Orbital Segment (ROS) and U.S. Orbital Segment (USOS). Allocation of the U.S. side of ISS hardware between nations. Columbus: 51% for ESA, 46.7% for NASA and 2.3% for CSA. Kibō: 51% for JAXA, 46.7% for NASA and 2.3% for CSA. Destiny: 97.7% for NASA and 2.3% for CSA. Crew time, electrical power and rights to purchase supporting services (such as data upload & download and communications) are divided 76.6% for NASA, 12.8% for JAXA, 8.3% for ESA, and 2.3% for CSA. Long-duration flights to the International Space Station are broken into expeditions. Expeditions have an average duration of half a year, and they commence following the official handover of the station from one Expedition commander to another. Expeditions 1 through 6 consisted of three-person crews, but the Space Shuttle Columbia disaster led to a reduction to two crew members for Expeditions 7 to 12. Expedition 13 saw the restoration of the station crew to three. While only three crew members are permanently on the station, several expeditions, such as Expedition 16, have consisted of up to six astronauts or cosmonauts. Only 3 members were active at any given time, one of the 'seats' was rotated out during separate flights. STS-115 expanded of the living volume and capabilities of the station so that it could host a crew of six. Expedition 20 was the first ISS crew of this size. Expedition 20's crew was lifted to the station in two separate Soyuz-TMA flights launched at two different times (each Soyuz-TMA can hold only three people): Soyuz TMA-14 on 26 March 2009 and Soyuz TMA-15 on 27 May 2009. However, the station would not be permanently occupied by six crew members all year. For example, when the Expedition 20 crew (Roman Romanenko, Frank De Winne and Bob Thirsk) returned to Earth in November 2009, for a period of about two weeks only two crew members (Jeff Williams and Max Surayev) were aboard. This increased to five in early December, when Oleg Kotov, Timothy Creamer and Soichi Noguchi arrived on Soyuz TMA-17. It decreased to three when Williams and Surayev departed in March 2010, and finally returned to six in April 2010 with the arrival of Soyuz TMA-18, carrying Aleksandr Skvortsov, Mikhail Korniyenko and Tracy Caldwell Dyson. The International Space Station is the most-visited spacecraft in the history of space flight. As of 9 October 2015[update], The ISS has had 220 visitors. Mir had 137 visitors (104 different people). Spacecraft from four different space agencies visit the ISS, serving a variety of purposes. The Automated Transfer Vehicle from the European Space Agency, the Russian Roskosmos Progress spacecraft and the H-II Transfer Vehicle from the Japan Aerospace Exploration Agency have provided resupply services to the station. In addition, Russia supplies a Soyuz spacecraft used for crew rotation and emergency evacuation, which is replaced every six months. Finally, the US serviced the ISS through its Space Shuttle program, providing resupply missions, assembly and logistics flights, and crew rotation until the program was retired in 2011. SpaceX was the first private company to resupply the ISS  in October 8, 2012. The availability of docking ports on the station, and traffic from four different agencies and launch sites must be coordinated. Spacecraft launches can see delays while waiting for traffic to clear  A particular tight traffic jam occurred during the latch of ESA's Jules Verne Automated Transfer Vehicle in spring 2008. The cargo ship launched 2 day prior to STS-123, and had to wait in a holding orbit performing system tests while waiting for the shuttle to clear the station. As of 13 April 2016[update], there have been 46 Soyuz, 63 Progress, 5 ATV, 5 HTV, 5 Cygnus, 7 Dragon and 37 Space Shuttle flights to the station. Expeditions require, on average, 2,722 kg of supplies, Soyuz crew rotation flights and Progress resupply flights visit the station on average two and three times respectively each year. NASA's Mission Control Center at Lyndon B. Johnson Space Center in Houston, Texas, serves as the primary control facility for the US segment of the ISS and also controls the Space Shuttle missions that visit the station. NASA's Payload Operations and Integration Center at Marshall Space Flight Center in Huntsville, Alabama, serves as the center that coordinates all payload operations in the US Segment. This center links Earth-bound researchers around the world with their experiments and astronauts aboard the International Space Station. Roskosmos's Mission Control Center at Korolyov, Moscow, controls the Russian Orbital Segment of the ISS, in addition to individual Soyuz and Progress missions. ESA's Columbus Control Center at the German Aerospace Center (DLR) in Oberpfaffenhofen, Germany, controls the European Columbus research laboratory. ESA's ATV Control Center, at the Toulouse Space Centre (CST) in Toulouse, France, controls flights of the unmanned European Automated Transfer Vehicle. JAXA's JEM Control Centre and HTV Control Centre at Tsukuba Space Center (TKSC) in Tsukuba, Japan, are responsible for operating the Japanese Experiment Module complex and all flights of the unmanned Japanese H-II Transfer Vehicle respectively. On January 18, 2006 NASA announced Commercial Orbital Transportation Services programme. NASA has suggested that "Commercial services to ISS will be necessary through at least 2015." Instead of flying payloads to ISS on government-operated vehicles, NASA would spend $500 million (less than the cost of a single Space Shuttle flight) through 2010 to finance the demonstration of orbital transportation services from commercial providers. COTS must be distinguished from the related Commercial Resupply Services (CRS) program. COTS relates to the development of the vehicles, CRS to the actual deliveries. COTS involves a number of Space Act Agreements, with NASA providing milestone-based payments. On December 23, 2008, NASA entered into CRS contracts with Orbital Sciences and SpaceX to utilize their COTS cargo vehicles—Cygnus and Dragon, respectively—for cargo delivery to the International Space Station. Constellation Program, a human spaceflight program, was developed by NASA. On February 1, 2010, President Barack Obama announced a proposal to cancel the program effective with the U.S. 2011 fiscal year budget, but later announced changes to the proposal in a major space policy speech at Kennedy Space Center on April 15, 2010, which including reviving the Orion capsule for use as a rescue spacecraft for ISS. The heads of the ISS agencies from Canada, Europe, Japan, Russia and the United States meet in Tokyo to review ISS cooperation. Former NASA Administrator Michael D. Griffin says the International Space Station has a role to play as NASA moves forward with a new focus for the manned space programme, which is to go out beyond Earth orbit for purposes of human exploration and scientific discovery. "The International Space Station is now a stepping stone on the way, rather than being the end of the line," Griffin said. Griffin has said that station crews will not only continue to learn how to live and work in space, but also will learn how to build hardware that can survive and function for the years required to make the round-trip voyage from Earth to Mars. Despite this view, however, in an internal e-mail leaked to the press on 18 August 2008 from Griffin to NASA managers, Griffin apparently communicated his belief that the current US administration had made no viable plan for US crews to participate in the ISS beyond 2011, and that the Office of Management and Budget (OMB) and Office of Science and Technology Policy (OSTP) were actually seeking its demise. 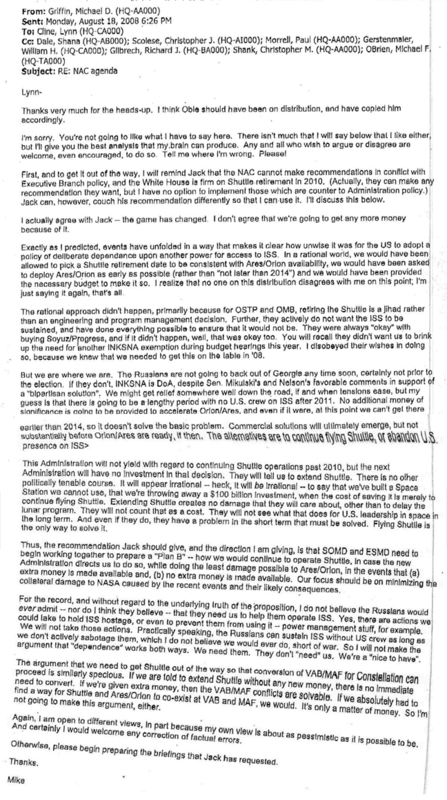 The e-mail appeared to suggest that Griffin believed the only reasonable solution was to extend the operation of the space shuttle beyond 2010, but noted that Executive Policy (i.e. the White House) was firm that there will be no extension of the space shuttle retirement date, and thus no US capability to launch crews into orbit until the Ares I/Orion system becomes operational in 2014, at the earliest. He did not see purchase of Russian launches for NASA crews as politically viable following the 2008 South Ossetia war, and hoped the incoming Barack Obama administration would resolve the issue in 2009 by extending space shuttle operations beyond 2010. A solicitation issued by NASA JSC indicates NASA's intent to purchase from Roscosmos "a minimum of 3 Soyuz seats up to a maximum of 24 seats beginning in the Spring of 2012" to provide ISS crew transportation. The leaked internal email fails to provide the contextual framework for my remarks, and my support for the administration's policies. Administration policy is to retire the shuttle in 2010 and purchase crew transport from Russia until Ares and Orion are available. The administration continues to support our request for an INKSNA exemption. Administration policy continues to be that we will take no action to preclude continued operation of the International Space Station past 2016. I strongly support these administration policies, as do OSTP and OMB. On 15 October 2008, President Bush signed the NASA Authorization Act of 2008, giving NASA funding for one additional mission to "deliver science experiments to the station". The Act allows for an additional space shuttle flight, STS-134, to the ISS to install the Alpha Magnetic Spectrometer, which was previously cancelled. President Barack Obama has supported the continued operation of the station, and supported the NASA Authorization Act of 2008. Obama's plan for space exploration includes finishing the station and completion of the Orion spacecraft programme. The operation of the ISS was extended to 2030 by a Senate Bill passed in December 2018. China has reportedly expressed interest in the project, especially if it would be able to work with the RKA. However, as of 2009[update] China is not involved due to US objections concerning its human rights record and issues surrounding technology transfer. The heads of both the South Korean and Indian space agencies announced at the first plenary session of the 2009 International Astronautical Congress on 12 October that their nations intend to join the ISS program. The talks began in 2010, and were not successful. The heads of agency also expressed support for extending ISS lifetime. European countries not a part of the International Space Station program will be allowed access to the station in a three-year trial period, ESA officials say. The most cited figure of an estimate of overall costs of the ISS ranges from 35 billion to 160 billion USD. ESA, the only agency actually stating potential overall costs on its website, estimates €100 billion. Giving a precise cost estimate for the ISS is not straightforward, as it is difficult to determine which costs should actually be contributed to the ISS program, or how the Russian contribution should be measured. NASA's current budget projections see an end to ISS funding in 2017, in order to free funds for the Vision for Space Exploration. The overall majority of costs for NASA are incurred by flight operations and expenses for the overall management of the ISS. Costs for initially building the U.S. portion of the ISS modules and external structure on the ground and construction in space as well as crew and supply flights to the ISS do account for far less than the general operating costs (see annual budget allocation below). NASA does not include the basic Space Shuttle program costs in the expenses incurred for the ISS program, despite the fact that the Space Shuttle has been nearly exclusively used for ISS construction and supply flights since December 1998. NASA's 2007 budget request lists costs for the ISS (without Shuttle costs) as $25.6 billion for the years 1994 to 2005. For each of 2005 and 2006 about $1.7 to 1.8 billion are allocated to the ISS program. The annual expenses will increase until 2010 when they will reach $2.3 billion and should then stay at the same level, however inflation-adjusted, until 2016, the defined end of the program. NASA has allocated between $300 and 500 million for program shutdown costs in 2017. NASA allocates about 125 million US dollars (USD) annually to EVAs. Development of new hardware: $70 million were allocated to core development, for instance development of systems like navigation, data support or environmental. Spacecraft Operations: $800 million consisting of $125 million for each of software, extravehicular activity systems, and logistics and maintenance. An additional $150 million is spent on flight, avionics and crew systems. The rest of $250 million goes to overall ISS management. Launch and Mission operations: Although the Shuttle launch costs are not considered part of the ISS budget, mission and mission integration ($300 million), medical support ($25 million) and Shuttle launch site processing ($125 million) is within the ISS budget. Operations Program Integration: $350 million was spent on maintaining and sustaining U.S. flight and ground hardware and software to ensure integrity of the ISS design and the continuous, safe operability. ISS cargo/crew: $140 million was spent for purchase of supplies, cargo and crew capability for Progress and Soyuz flights. The only non-ISS-related Shuttle flight between 2005 and 2011 was a Hubble Space Telescope servicing mission on STS-125. Only costs for mission and mission integration and launch site processing for the 33 ISS-related Shuttle flights are included in NASA's ISS program costs. Basic costs of the Shuttle program are, as mentioned above, not considered part of the overall ISS costs by NASA, because the Shuttle program is considered an independent program aside from the ISS. Since December 1998 the Shuttle has, however, been used nearly exclusively for ISS flights (since the first ISS flight in December 1998, until October 2007 only 5 flights out of 28 flights have not been to the ISS, and only the planned Hubble Space Telescope servicing mission in 2009 will not be ISS-related out of 13 planned missions until the end of the Space Shuttle program in 2010). The Space Shuttle was retired from service upon the conclusion of Atlantis' final flight on July 21, 2011. NASA was reliant even at the time on some of the resupply contracts being fielded out to Soyuz and Progress and the other unmanned tugs, but it had launched a few years earlier into a program of aggressive development of commercial US resupply vehicles. At the beginning of 2014 both SpaceX's Dragon and Orbital's Cygnus vehicles have fulfilled commercial resupply contracts, and NASA will be shifting to full-time reliance on these, and possibly in the medium-term future SNC's Dream Chaser and the NASA-developed Orion capsule. On January 8, 2014, the White House announced that the ISS was having its funding extended from an outlook that ended in 2020 to at least 2024. An estimate was issued that it would cost $3B/year for 2012-2024, a substantial share of NASA's then-$17B budget. ESA calculates that its contribution over the 15 year lifetime of the project will be €9 billion. Just the costs for the Columbus Laboratory tops more than €1.4 billion (about $2.1 billion), including the money spent on the ground control infrastructure known as Columbus Control Center to operate it. The total development costs for ATV amount to approximately €1.35 billion and considering that each Ariane 5 launch costs around €150 million, each ATV launch will incur considerable costs as well. The ISS has been far more expensive than originally anticipated. The ESA estimates the overall cost from the start of the project in the early 1990s to the prospective end in 2017 to be in the region of €100 billion ($157 billion or £65.3 billion). The development of the Japanese Experiment Module, JAXA's main contribution to the ISS, has cost about 325 billion yen (about $2.8 billion). In the year 2005, JAXA allocated about 40 billion yen (about 350 million USD) to the ISS program. The annual running costs for Japanese Experiment Module will total around $350 to 400 million. In addition JAXA has committed itself to develop and launch the H-II Transfer Vehicle, for which development costs total nearly $1 billion. In total, over the 24 year lifespan of the ISS program, JAXA will contribute well over $10 billion to the ISS program. A considerable part of the Russian Space Agency's budget is used for the ISS. Since 1998 there have been over two dozen Soyuz and Progress flights, the primary crew and cargo transporters since 2003. The question of how much Russia spends on the station (measured in USD), is, however, not easy to answer. The two modules currently in orbit are derivatives of the Mir program and therefore development costs are much lower than for other modules. In addition, the exchange rate between ruble and USD is not adequately giving a real comparison to what the costs for Russia really are. Canada, whose three main contributions to the ISS are the Canadarm2, the mobile base system, and Dextre (the Special Purpose Dexterous Manipulator, also known as the Canada Hand), estimates that through the last 20 years it has contributed about C$1.4 billion to the ISS. Canada has continued to be a vital member of ISS through the past ten years and continues to play a major role in the ISS. The International Space Station has been the target of varied criticism over the years. Critics contend that the time and money spent on the ISS could be better spent on other projects—whether they be robotic spacecraft missions, space exploration, investigations of problems here on Earth, or just tax savings. Some critics, like Robert L. Park, argue that very little scientific research was convincingly planned for the ISS in the first place. They also argue that the primary feature of a space-based laboratory is its microgravity environment, which can usually be studied more cheaply with a "vomit comet". One of the most ambitious ISS projects to date, the Centrifuge Accommodations Module, has been cancelled due to the prohibitive costs NASA faces in simply completing the ISS. As a result, the research done on the ISS is generally limited to experiments which do not require any specialized apparatus. For example, in the first half of 2007, ISS research dealt primarily with human biological responses to being in space, covering topics like kidney stones, circadian rhythm, and the effects of cosmic rays on the nervous system. Jeff Foust argued that the ISS requires too much maintenance, especially by risky, expensive EVAs. The magazine The American Enterprise reports, for instance, that ISS astronauts "now spend 85 percent of their time on construction and maintenance" alone. The Astronomical Society of the Pacific has mentioned that its orbit is rather highly inclined, which makes Russian launches cheaper, but US launches more expensive. This was intended as a design point, to encourage Russian involvement with the ISS—and Russian involvement saved the project from abandonment in the wake of the Space Shuttle Columbia disaster—but the choice may have increased the costs of completing the ISS substantially. However, it may not be true since additional delta-v required from launching Kennedy space center (28.45 deg) to ISS station (51.6 deg of Russia) is ~34.5 m/s ( 460 m/s*cos(28.45)*cos(51.6) - 460*cos(51.6) )which is very small (~0.3% velocity or ~1% payload reduction) compare to 9.5 to 10 km/s required to reach to orbit. However if launching from 51 deg to 28 deg could cost as much as ~3 km/s or >60% payload reduction (assuming direction correction at same orbital altitude, 7.67 km/s * 2*sin((51.6-28.8)/2) ). This is due to the fact that delta-v adjustment happens at different respective instantaneous velocities ( 0 m/s on ground for USA but 7.67 km/s for Russia). In response to some of these criticisms, advocates of manned space exploration say that criticism of the ISS project is short-sighted, and that manned space research and exploration have produced billions of dollars' worth of tangible benefits to people on Earth. Jerome Schnee estimated that the indirect economic return from spin-offs of human space exploration has been many times the initial public investment. A review of the claims by the Federation of American Scientists argued that NASA's rate of return from spin-offs is actually "astoundingly bad", except for aeronautics work that has led to aircraft sales. Critics also say that NASA is often casually credited with "spin-offs" (such as Velcro and portable computers) that were developed independently for other reasons. NASA maintains a list of spin-offs from the construction of the ISS, as well as from work performed on the ISS. However, NASA's official list is much narrower and more arcane than dramatic narratives of billions of dollars of spin-offs. It is therefore debatable whether the ISS, as distinct from the wider space program, will be a major contributor to society. Some advocates argue that apart from its scientific value, it is an important example of international cooperation. Others claim that the ISS is an asset that, if properly leveraged, could allow more economical manned Lunar and Mars missions. Either way, advocates[who?] argue that it misses the point to expect a hard financial return from the ISS; rather, it is intended as part of a general expansion of spaceflight capabilities. In 2009, NASA had stated plans to end the ISS program and deorbit the ISS in early 2016. This was in accordance with the then-President Bush's policy. President Obama announced new policy in 2010, and extended the program through 2020. In December 2018, a U.S. Senate bill passed, announcing the program to be extended by 10 years to 2030. All five ISS-participating space agencies had indicated in 2010 their desire to see the platform continue flying beyond 2015, but Europe struggled to agree on funding arrangements within its member states, until agreement was reached in March 2011. Russia and ISS partners in a 2011 statement said that work is being done to make sure other modules can be used beyond 2015. The first Russian module was launched in 1998, and the 30th anniversary of that module's launch has been chosen as a target date for certification of all components of the ISS. According to a 2009 report, RKK Energia is considering methods to remove from the station some modules of the Russian Orbital Segment when the end of mission is reached and use them as a basis for a new station, known as the Orbital Piloted Assembly and Experiment Complex (OPSEK). The modules under consideration for removal from the current ISS include the Multipurpose Laboratory Module (MLM), currently scheduled to be launched mid-2018, along with other Russian modules which are currently planned to be attached to the MLM. Neither the MLM nor any additional modules attached to it would have reached the end of their useful lives by 2020. The report presents a statement from an unnamed Russian engineer who believes that, based on the experience from Mir, a thirty-year life should be possible, except for micrometeorite damage, because the Russian modules have been built with on-orbit refurbishment in mind. According to the Outer Space Treaty the United States is legally responsible for all modules it has launched. In ISS planning, NASA examined options including returning the station to Earth via shuttle missions (deemed too expensive, as the station(USOS) is not designed for disassembly and this would require at least 27 shuttle missions), natural orbital decay with random reentry similar to Skylab, boosting the station to a higher altitude (which would simply delay reentry) and a controlled targeted de-orbit to a remote ocean area. The technical feasibility of a controlled targeted deorbit into a remote ocean was found to be possible only with Russia's assistance. At the time ISS was launched, the Russian Space Agency had experience from de-orbiting the Salyut 4, 5, 6, and 7 space stations, while NASA's first intentional controlled de-orbit of a satellite (the Compton Gamma Ray Observatory) would not occur for another two years. NASA currently has no spacecraft capable of de-orbiting the ISS at the time of decommissioning. Skylab, the only space station built and launched entirely by the US, decayed from orbit slowly over 5 years, and no attempt was made to de-orbit the station using a deorbital burn. Remains of Skylab hit populated areas of Esperance, Western Australia. without injuries or loss of life. While the entire USOS cannot be reused and will be discarded, some Russian modules will be reused. Nauka, the Node module, two science power platforms and Rassvet, launched between 2010 and 2015 and joined to the ROS will be separated to form the next Russian space station OPSEK. ^ "International Space Station - International Cooperation". Retrieved 19 January 2018. ^ a b "International Space Station Legal Framework". International Space Station. European Space Agency. 20 July 2001. Retrieved 16 September 2006. ^ Farand, Andre. "Astronauts' behaviour onboard the International Space Station: regulatory framework" (PDF). International Space Station. UNESCO. Archived from the original (pdf) on 13 September 2006. Retrieved 16 September 2006. ^ "A Look at the Russian Side of the Space Station". Air&Space Mag. 5 March 2016. Retrieved 5 March 2016. ^ a b "ISS Intergovernmental Agreement". ESA. April 19, 2009. Archived from the original on June 10, 2009. Retrieved 2009-04-19. ^ a b "Memorandum of Understanding Between the National Aeronautics and Space Administration of the United States of America and the Government of Japan Concerning Cooperation on the Civil International Space Station". NASA. February 24, 1998. Archived from the original on 2009-10-29. Retrieved 2009-04-19. ^ a b "Memorandum of Understanding Between the National Aeronautics and Space Administration of the United States of America and the Canadian Space Agency Concerning Cooperation on the Civil International Space Station". NASA. January 29, 1998. Archived from the original on 2009-10-29. Retrieved 2009-04-19. ^ a b "International Space Station Expeditions". NASA. 10 April 2009. Archived from the original on 8 September 2005. Retrieved 13 April 2009. ^ a b NASA (2008). "International Space Station". NASA. Archived from the original on 7 September 2005. Retrieved 22 October 2008. ^ David Harland (30 November 2004). The Story of Space Station Mir. New York: Springer-Verlag New York Inc. ISBN 978-0-387-23011-5. ^ Garcia, Mark (3 April 2015). "International Space Station Commercial Resupply Launch". nasa.gov. Retrieved 2 April 2018. ^ ESA (22 March 2007). "Worldwide testing and ISS traffic push ATV launch to autumn 2007". ESA. Retrieved 11 April 2010. ^ Tariq Malik (31 January 2008). "Traffic jam in space: ATV docking under tight schedule". ESA. Retrieved 11 April 2010. ^ "About the Space Station: Facts and Figures". ^ "Live listing of spacecraft operations". NASA. 1 December 2009. Retrieved 8 December 2009. ^ a b c d e f g Gary Kitmacher (2006). Reference Guide to the International Space Station. Canada: Apogee Books. pp. 71–80. ISBN 978-1-894959-34-6. ISSN 1496-6921. ^ "NASA - International Space Station: Payload Operations Center". NASA. 23 November 2007. Archived from the original on 28 September 2006. Retrieved 11 April 2010. ^ "NASA Seeks Proposals for Crew and Cargo Transportation to Orbit" (Press release). NASA. 2006-01-18. Retrieved 2006-11-21. ^ Space Operations Mission Directorate (2006-08-30). "Human Space Flight Transition Plan" (PDF). NASA. Archived from the original (PDF) on 2006-09-28. ^ "Terminations, Reductions, and Savings" (PDF). Archived from the original (PDF) on March 5, 2010. Retrieved March 7, 2010. ^ a b Griffin, Michael (July 18, 2001). "Why Explore Space?". NASA. Archived from the original on August 24, 2007. Retrieved 2008-07-31. ^ Malik, Tariq (2008). "NASA Chief Vents Frustration in Leaked E-mail". Space.com. Imaginova Corp. Retrieved 2008-11-06. ^ a b c Orlando Sentinel (July 7, 2008). "Internal NASA email from NASA Administrator Griffin". SpaceRef.com. Retrieved 2008-11-03. ^ Griffin, Michael (2008). "Michael Griffin email image". Orlando Sentinel. Archived from the original (jpg) on December 16, 2008. Retrieved 2008-11-06. ^ "PROCUREMENT OF CREW TRANSPORTATION AND RESCUE SERVICES FROM ROSCOSMOS". NASA JSC. ^ "Statement of NASA Administrator Michael Griffin on Aug. 18 Email" (Press release). NASA. September 7, 2008. Archived from the original on 2009-10-28. Retrieved 2008-12-11. ^ "To authorize the programs of the National Aeronautics and Space Administration". Library of Congress. 2008. Retrieved 2008-10-25. ^ Berger, Brian (June 19, 2008). "House Approves Bill for Extra Space Shuttle Flight". Space.com. Imaginova Corp. Retrieved 2008-10-25. ^ NASA (September 27, 2008). "House Sends NASA Bill to President's Desk". Spaceref.com. Retrieved 2008-11-23. ^ Matthews, Mark (October 15, 2008). "Bush signs NASA authorization act". Orlando Sentinel. Archived from the original on October 19, 2008. Retrieved 2008-10-25. ^ a b Berger, Brian for Space.com (September 23, 2008). "Obama backs NASA waiver, possible shuttle extension". USA Today. Retrieved 2008-11-06. ^ BarackObama.com (2008). "Barack Obama's Plan For American Leadership in Space". Spaceref.com. Retrieved 2008-11-06. ^ "China wants role in space station". CNN. Associated Press. 16 October 2007. Archived from the original on 14 March 2008. Retrieved 20 March 2008. ^ James Oberg (26 October 2001). "China takes aim at the space station". MSNBC. Retrieved 30 January 2009. ^ "South Korea, India to begin ISS partnership talks in 2010". Flight International. October 14, 2009. Retrieved 2009-10-14. ^ "EU mulls opening ISS to more countries". www.space-travel.com. Retrieved 2 April 2018. ^ Alan Boyle (2006). "What's the cost of the space station?". MSNBC. Retrieved September 30, 2008. ^ a b "How Much Does It Cost?". ESA. Retrieved 2008-03-27. ^ "NASA 2007 Budget and 2006 Strategic Plan". International Space Station. NASA. 2006. Archived from the original on 18 October 2004. Retrieved 16 September 2006. ^ "International Space Station Major Events FY 2005" (PDF). International Space Station. NASA. 2005. Archived from the original (PDF) on 1 November 2004. Retrieved 16 September 2006. ^ "European Hopes Ride on New Space Lab, Cargo Ship". space.com. Retrieved 2 April 2018. ^ sh, redaktion dlr.de db,. "DLR - International Space Station ISS - Europe sets a course for the ISS". www.dlr.de. Retrieved 2 April 2018. ^ "Japan Prepares Space Station's Largest Laboratory for Flight". space.com. Retrieved 2008-05-28. ^ "Japan Seeking 13 Percent Budget Hike for Space Activities". space.com. Archived from the original on December 6, 2008. Retrieved 2008-05-28. ^ "International Space Station facts and figures". Archived from the original on 2008-06-03. Retrieved 2007-01-28. ^ Mail & Guardian. "A waste of space". Mail & Guardian. Retrieved 2009-03-15. ^ Park, Bob. "Space Station: Maybe They Could Use It to Test Missile Defense". Archived from the original on 2009-03-22. Retrieved 2009-03-23. ^ Park, Bob. "Space: International Space Station Unfurls New Solar Panels". Archived from the original on 2008-07-04. Retrieved 2007-06-15. ^ NASA (2007). "Renal Stone Risk During Spaceflight: Assessment and Countermeasure Validation (Renal Stone)". NASA. Archived from the original on September 16, 2008. Retrieved November 13, 2007. ^ NASA (2007). "Sleep-Wake Actigraphy and Light Exposure During Spaceflight-Long (Sleep-Long)". NASA. Archived from the original on September 16, 2008. Retrieved November 13, 2007. ^ NASA (2007). "Anomalous Long Term Effects in Astronauts' Central Nervous System (ALTEA)". NASA. Archived from the original on November 30, 2007. Retrieved November 13, 2007. ^ Jeff Foust (2005). "The trouble with space stations". The Space Review. Retrieved 2009-03-23. ^ James J. Secosky; George Musser (1996). "Up, Up, and Away". Astronomical Society of the Pacific. Retrieved September 10, 2006. ^ Ginzburg, E.; Kuhn, J. W.; Schnee, J.; Yavitz, B. (1976). "Economic impact of large public programs The NASA experience". NASA Technical Reports Server (NTRS). Retrieved November 13, 2007. ^ Federation of American Scientists. "NASA Technological Spinoff Fables". Federation of American Scientists. Retrieved September 17, 2006. ^ Park, Robert. "The Virtual Astronaut". The New Atlantis. Retrieved 2007-01-28. ^ NASA (2007). "NASA Spinoff". NASA Scientific and Technical Information (STI). Retrieved November 13, 2007. ^ NASA Center for AeroSpace Information (CASI) (2005-10-21). "International Space Station Spinoffs". NASA. Archived from the original on 2006-09-28. Retrieved 2006-09-14. ^ Space Today Online (2003). "International Space Station: Human Residency Third Anniversary". Space Today Online. Archived from the original on March 2, 2009. Retrieved 2009-03-23. ^ RSC Energia (2005). "Interview with Niolai (sic) Sevostianov, President, RSC Energia: The mission to Mars is to be international". Mars Today.com/SpaceRef Interactive Inc. Archived from the original on 2013-01-28. Retrieved 2009-03-23. ^ Joel Achenbach (13 July 2009). "As Space Station Nears Completion, It Faces End of Mission". The Washington Post. Retrieved 18 July 2009. ^ "Statement by Charlie Bolden, NASA Budget Press Conference" (PDF) (Press release). NASA. 1 February 2010. Archived from the original (PDF) on 1 February 2010. Retrieved 1 February 2010. ^ a b Stephen Clark (11 March 2010). "Space station partners set 2028 as certification goal". Spaceflight Now. Retrieved 14 March 2010. ^ "International Space Station Could Fly Through 2028, NASA Partners Say". Space.com. Retrieved 2011-05-23. ^ "International Partners Discuss Space Station Extension and Use". SpaceRef.com. 22 September 2010. Retrieved 23 September 2010. ^ Anatoly Zak (22 May 2009). "Russia 'to save its ISS modules'". BBC News. Retrieved 23 May 2009. ^ United Nations Treaties and Principles on Outer Space. (PDF) . United Nations. New York. 2002. ISBN 92-1-100900-6. Retrieved on 2011-10-08. ^ Thomas Kelly (2000). Engineering Challenges to the Long-Term Operation of the International Space Station. National Academies Press. pp. 28–30. ISBN 0-309-06938-6. Retrieved 2011-07-12. ^ a b "Tier 2 EIS for ISS" (PDF). NASA. Retrieved 2011-07-12. ^ "Entry Debris Field estimation methods and application to Compton Gamma Ray Observatory" (PDF). Mission Operations Directorate, NASA Johnson Space Center. Retrieved 12 July 2011. ^ Rob Coppinger (7 March 2007). "NASA may buy ESA's ATV to de-orbit ISS at end of life". Flightglobal. Retrieved 27 September 2009. ^ "Paul Maley's (Skylab spaceflight controller) Space Debris Page". Archived from the original on 27 February 2005. Retrieved 28 May 2011. ^ "DC-1 and MIM-2". Russianspaceweb.com. Archived from the original on 10 February 2009. Retrieved 12 July 2011.